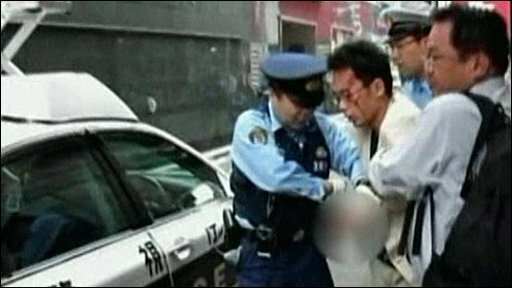 Police in Japan are examining whether a man who went on a stabbing spree in Tokyo warned of his actions on an internet site, media reports say. Seven people died and 10 others were injured in the attack in central Tokyo's Akihabara shopping district on Sunday. 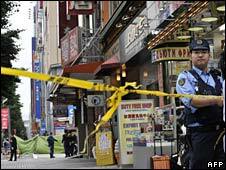 Twenty-five year-old Tomohiro Kato was arrested by police at the scene. Mourners have begun to leave tributes at the site of the attack, which has shocked Japan. The incident happened on Sunday afternoon when the district, known for its electronics outlets, was crowded with shoppers. A man drove a rented truck into a crowd and then began stabbing people at random. Six men, ranging in age from 19 to 74, and a 21-year-old woman were killed, Kyodo News agency said. Paramedics erected makeshift tents to treat the injured on site before rushing them to hospital. Mr Kato, a factory employee from Shizuoka prefecture, was overpowered and arrested by police at the scene. They said he told them he came to Akihabara to kill people because he was "tired of life". On Monday, investigators said that they were looking at a series of messages sent by mobile phone to a website that appeared to foretell the attack. "I'll crash my vehicle into people and if the vehicle becomes useless, I'll get out a knife. Goodbye everyone! ", Japanese media reports quoted one posting early on Sunday morning as saying. Subsequent messages appeared to chart the suspect's journey from Shizuoka to Tokyo. "No postponement because of rainy weather," said a later message, Kyodo news agency reported. Another posting, some 20 minutes before the attack, simply said: "It's time," Kyodo added. Japanese police said that they were investigating what may have motivated the attack. At a news conference on Monday, Chief Cabinet Secretary Nobutaka Machimura said the government was considering tightening restrictions on large-bladed knifes in response to the attack. "We need to think of the possibility of discussing tightening the control of guns and knives," he said. Once rare in Japan, there has been an increase in knife crime in recent years. In January, a 16-year-old school boy armed with two kitchen knives injured several people on a crowded shopping street in Tokyo's Shinagawa district. The Akihabara attack occurred on the same date that a man with a history of mental illness stabbed children to death at an Osaka primary school in 2001.